Great taste 2014. Free from artificial colours & flavours. 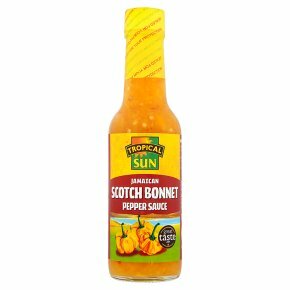 Suitable for vegetarians.Known affectionately as the 'Ball of Fire Pepper' in the Caribbean, the scotch bonnet pepper is a surefire way of adding some serious spice to your life. Made exclusively from the fruity yellow variety of the pepper, the Tropical Sun Scotch Bonnet Sauce is the perfect accompaniment to your barbeque wings, codfish fritters and mac 'n' cheese. Spice-wimps be warned - this sauce is not for the faint hearted! Enjoy!